Roy Rogers was my first boyhood hero. For a time, around the age of three or four, I refused to answer to “Morgan,” insisting that my parents call me Roy. 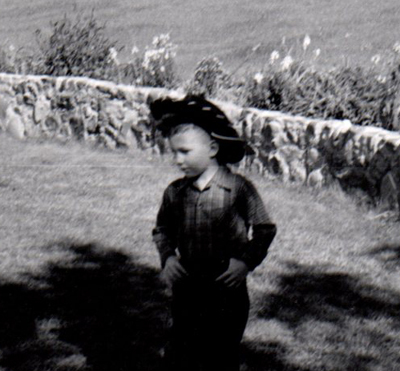 Me as Roy, probably age 4. No matter that any residual appreciation for him collapsed during the Vietnam war, after he came out as a hawk – Roy Rogers was the first person who carried for me, the imagination of what a life well lived might look like. There is no way this ends well! For 20 years, I followed the teachings of Paramahansa Yogananda (1893-1952), a Hindu master who moved to this country in 1920, to found an international organization that teaches the core unity of all religions and gives instruction in meditation practices to enable people to make this discovery for themselves. I remember in college, how I used to marvel at the tragic heroes and their flaws, in Greek Tragedies and in Shakespeare – how their every action to escape their fate led them deeper into the jaws of the trap. We are seeing in real time, how a nation can tread the same course to disaster. This entry was posted in #TheResistance, Culture, Dream, Myth, Spirituality, Television and tagged Culture, imagination, Joseph Campbell, Myth, Paramahansa Yogananda, Roy Rogers, spirituality, stories. Bookmark the permalink. Thanks for this. It really is the only answer to the ill winds that toss the surface waves of the age we live in. I have in mind some elaboration of that, and your reply prompts me to do so. Thanks. Reblogged this on Myriad Ways. "Be a Lamp Unto Yourself"